It is vital to arrange healthy and nutritious food for your canine so that they can have the comfortable stay. You can provide nutritious dry and wet food to your four-legged friends. Here I will throw attention on dry dog foods. There are many types of dry foods that contain 6-10% of moisture for your pet, and the famous one is Kibble. You will find it convenient and well suited to your budget. Managing dry dog food is effortless. To maintain it you don’t require refrigeration, and it can be extended in-bowl feeding time. You will find kibble appropriate for storage and feeding. Without the issue of spoilage, you can place the food for your dear pet so that he can have it at its own pace. 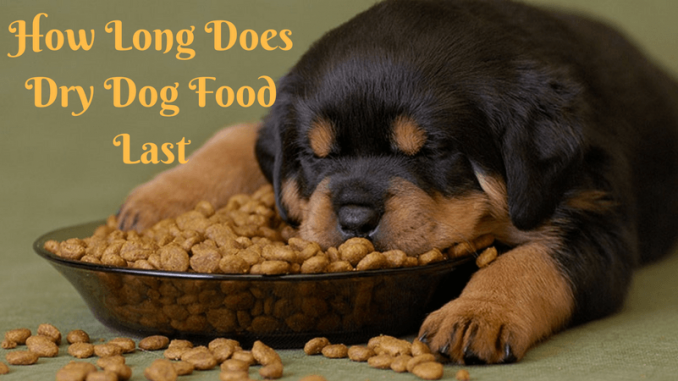 How Long Does Dry Dog Food Last? Dates should be printed correctly and with foolproof. There should not be any compromise with the packaging. Check the leakage of the cans and make sure bags are undamaged. Avoid the degradation of the food at the faster rate by keeping it away from the direct contact with the air, sunlight, hot temperatures and moisture. Try to maintain it in original packaging. In the cool and dry location, you can keep the tin dog food container. Torn or damaged bags should be strictly avoided. In 24 hours, the food kept in the vessel should be consumed so offer the limited amount. In this way, you can maintain the freshness of the foodstuff. Make use of hot and soapy water once in a week to clean the vessel used for offering the food. Prefer smaller dog food bags and within seven days trying to get it consumed. Add your fresh fat sources in the kibble so buy the kibble free from fats. To prevent oxidation, make sure you store the kibble in the freezer. Say no to plastic containers for storing the kibble. The perfect way is to save it in the original bag and then use the plastic container to keep the bag. All these steps will provide long life to dry dog food. You can rely on these guidelines so that both you and your dog can enjoy easy going stay. After discussing the guiding principles let’s move on to the topic of how to keep your dog’s food fresh? The dog food is in two forms – dry and canned. I have discussed dry foods now I will talk about canned foods. Store unopened canned food in cool and dry location. Consider “best by” dates point on the packet. Maximum for seven days you can store opened canned food in the refrigerator. After four hours the opened canned food which is left at room temperature should be thrown away. Before refilling the bowl make sure you clean it. You spent the good amount of money to buy high-quality dog food for your beloved pet. If you properly take care of dry and canned food, then you can enhance the life of the food. The Cesar puppy food is of good quality. If your dog avoids consuming the food offered by you, then check whether the food is in healthy and sound condition or not. In case the food gets rotten then immediately throw it away to save the health of your valued pet. Buy dog food from authentic manufacturers so that the quality can be maintained.